It’s not rare for the lights to go out in Togiak. But that could all change in September when a new power plant should be up and running. 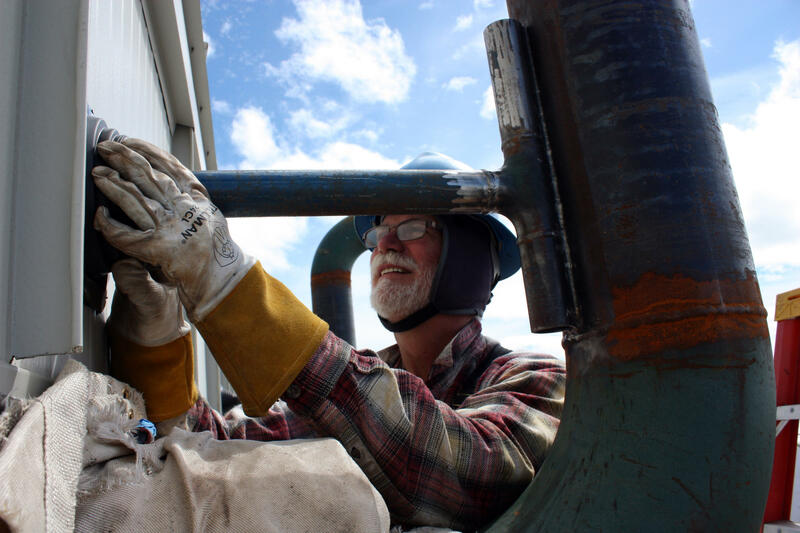 Electrician Joel Elson pointed out the features of the spotless new building across the street from the old, rusting plant and fuel tank farm. “We’re stepping into gen(erator) bay two, right now. These are the big generators that will be powering the village and keeping the lights on,” Elson explained. “They’re brand new, beautiful Cat engines, and they’re just top of the line. They’ve really done a great job putting them together here. The Alaska Village Electric Cooperative, or AVEC, is a nonprofit electric utility providing power to 58 communities, including Togiak. Constructing the new plant comes at a cost of $14.8 million, most of which comes from the federally funded Denali Commission. AVEC and Togiak Natives Limited each kicked in a portion of funding as well. Project manager Joseph Earsley said the old plant and tank farm just can’t keep up with the village’s needs anymore. 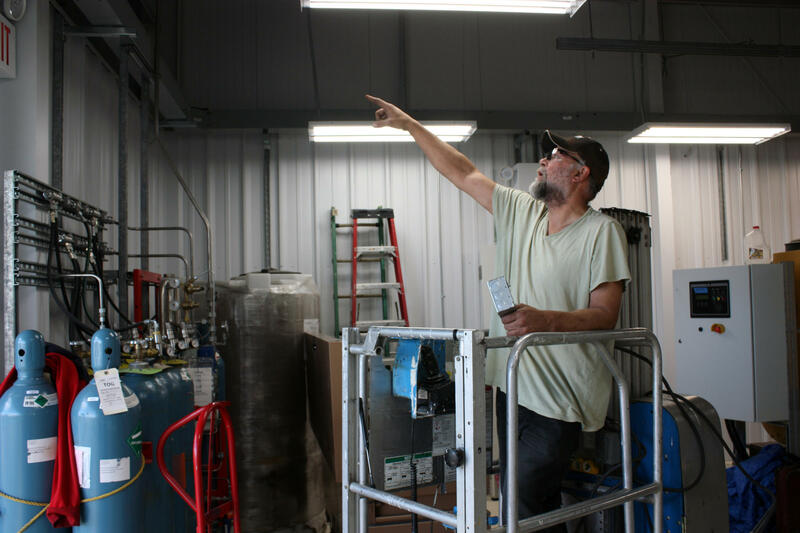 Electrician Joel Elson points out features of Togiak’s new power plant on Aug. 3, 2018. “It’s like trying to go up a hill with your car in too high of gear and there’s too much load and your car can’t chug up the hill,” Earsley said. Togiak is home to two seafood processors. These regular blackouts completely halt production, so fishermen and processors are excited for the new plant. Copper River Seafoods Manager Michael Gilbert is managing to process the catch from this summer’s record-breaking sockeye run, but it isn’t easy. Even though the loss of power is frustrating, the situation could be worse. Fisherman Martha Fox remembers years ago when power went out for days instead of hours. Back at the plant, Earsley said the four new diesel generators and new fuel tanks will be more reliable and reduce the risk of leaking contaminants into Togiak’s soil and groundwater. Earsley says everything should be up and running by mid-September. The new tank farm increases fuel capacity to 630,000 gallons of diesel, meaning they can bring down costs by barging it in less often. That’s in addition to cost savings from the top-of-the-line generators workers are now putting the finishing touches on. Earsley said the rusted, old equipment will be cleaned up and hauled off to a safe disposal site near Togiak. Going forward, the Alaska Energy Authority plans to install a transmission line from Togiak’s new plant to provide reliable energy to neighboring Twin Hills by the end of 2019. Twin Hills currently operates its own electric utility and will turn operation over to AVEC once that project is completed.